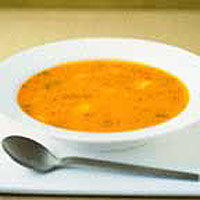 Pumpkin tastes superb in this soup but you could also try using a squash, such as kabocha or butternut. Using a sharp knife, cut the pumpkin in half and scoop out the seeds. Then peel and cut into small chunks. Heat the oil in a large pan and cook the onion over a low heat for 5-6 minutes until soft. Stir in the chilli and pumpkin and cook for another 2-3 minutes. Pour in the stock, bring to a simmer and cook for 10-12 minutes until the pumpkin is tender. Transfer to a blender or food processor and whizz in batches until smooth. Return the soup to a clean pan. Stir in the coriander and butter beans, then bring back to a simmer for 2-3 minutes until hot. Season and serve.